Thread lifting is viewed with a degree of suspicion amongst some medical aesthetic practitioners. Indeed, the Contour Threadlift system (Surgical Specialities Corp; Reading; Pennsylvania), which was approved by the FDA in 2005, has since lost its FDA approval due to the high incidence of post-operative complications,6 although new cogged suture variations are now available.7 When reviewing the literature regarding threads, it is important to note that although early data showed inconsistent results and early relapse, as new devices were developed and the indications for each technique were refined, the incidence of complications has decreased correspondingly in later studies.8 When performed properly, thread lifting is associated with minor and infrequent complications. It is perhaps better to consider thread lifting as a preliminary procedure, which combines well with other non-surgical procedures, rather than a surgical alternative. Threads can also be used to good effect post-surgery on a patient who has had a facelift and would like to lift the skin again, but is not ready for a second surgical procedure. It is important to distinguish initially between threads that are used for skin rejuvenation and threads that are used for lifting ptotic skin. These are both free-floating threads and not anchored to any point. Those for skin rejuvenation are used to give an overall improvement in the texture and tone of the skin and are monofilament threads, which are used in a lattice-work arrangement, inserted into the dermis. Usually around 10-120 threads are inserted at one time depending on the indication. These straight and smooth threads are mounted on a 25G-31G needle, inserted into the skin, where due to the folding of the thread on the needle mount, it becomes a ‘V’ shape and remains in the skin.9 These threads are most usually made of polydioxanone (PDO). If histology is performed, a foreign body reaction can be found from the middle dermis to the subcutaneous layer, and there is a fibrosis and lymphocyte clustering. After monofilament insertion there is a subtle but immediate lift evident.10 Threads for lifting can be either cogs or barbs, which mechanically lift the skin. The usual number of threads can be from one to five per side depending on what is being treated. Evidently, the type of thread to use is important – think about the treatment indications; is lift required or skin rejuvenation? A patient may not want dermal filler treatment but would like to see an improvement in their appearance: Threads can provide a viable alternative to those individuals who would like improvement without use of dermal fillers. Spring threads can be used as an easy alternative in the nasolabial, malar and marionette regions. Spring threads are monofilament threads, which have been coiled around the introducing needle to make a spring shape. Monofilament threads can be used as an alternative to dermal fillers used for hydration and collagen stimulation. A patient has had dermal fillers to lift the skin and would like more of a lift: There is a limited amount of lift achievable using dermal fillers alone because they are only capable of adding volumeandgiveliftasasecondaryeffectbyredistributingthe volume in the face. For those patients who have undergone augmentation using the ‘8-point lift’ or ‘Tower technique’,13 a method of depositing dermal filler in a perpendicular depot, cogged and barbed threads can provide a further improvement of the appearance by giving additional lift. Thread procedures often result in more downtime than that experienced when using injectables alone. For monofilament threads, the number of needle insertions necessary will inevitably result in bruising. For cogs and barbs, the entry point of the cannula or needle can be 16G, resulting in a visible entry area, and there can be irregularity of the skin over the thread tract for a couple of days. Patients differ with the amount of downtime they can tolerate, and what they perceive as downtime. Some patients will happily accept bruising and puckering for a number of days as being part of the procedure, whilst others will suffer a lack of confidence about their appearance if there are any visible signs of a procedure having taken place immediately after the treatment. Before discussing the possibility of using threads, it is important to know where your patient falls on this spectrum. Patient management post-thread procedure can be difficult if they do not fully grasp the risks of bruising, swelling and puckering following treatment. 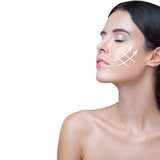 Unlike hyaluronic acid dermal fillers, the procedure cannot be easily reversed. It is important that all the possible complications and expected side effects are discussed, and the patient is given adequate time to weigh-up the information before deciding to go ahead. This is not a procedure suitable for consultation and treatment on the same day. It is essential that the patient is able to tolerate the procedure. Pain thresholds and acceptance of treatment varies widely from person to person. As threads are more invasive than injectables, it is important that the patient is able to tolerate a modicum of discomfort during the procedure. The sensation of having the barbed and cogged threads tightened can be uncomfortable, and for some a distressing experience. 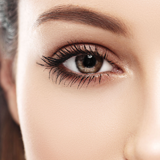 Asymmetry: A patient will often examine their appearance in great detail after a cosmetic procedure so it is important to point out any pre-existing asymmetries. In the case of barbs and cogs, precision when inserting the threads and tightening when the patient is seated vertically, with patient participation so they can view the process in a hand mirror, is helpful in avoiding any potential problems with perceived asymmetry later on. Rippling and puckering: This is a complication seen when using barbs and cogs. If the thread is tightened too much then the skin will ripple over the thread and cause visible folding. If the thread has been placed in the correct tissue plane then this will typically resolve itself in a few days. Sometimes slight ruching can be caused by oedema and the placement of local anaesthetic, swelling the tissues.15 It is important to be realistic when manipulating the thread and not to over tighten as this will not only lead to rippling, but also the tissues will drop again very quickly after a couple of days, thus leading to dissatisfaction for the patient and practitioner alike. Persistent dimpling can usually be corrected with manual manipulation several days post procedure. Infection: From what I’ve seen, reported infection rates post-thread insertions are extremely low. All types of threads should be placed using an aseptic technique to reduce the risk of infection, which, practically speaking, translates as use of betadine or chlorhexidine preparation, use of a sterile field such as surgical drapes for cogs and barbs (although this is not necessary for monofilament and springs) and use of a sterile dressing pack and gloves. Granuloma: Threads placed in a more superficial plane can lead to higher incidence of granuloma formation.16 In a study of 100 patients receiving either PDO or Prolene after minor breast biopsy, a buried knot eroded through the skin in 17% of PDO patients due to positioning and granuloma formation. Thread loss: It’s essential when placing threads that when the thread is cut, the end will tuck back into the skin – protrusion of a thread through the skin is an infection and granuloma risk and may cause distress to the patient. In the case of monofilament, if there is a protruding thread, the end should not be cut as with barbs and cogs, but grasped firmly and removed. It’s easy and cheap to remove a monofilament thread thus removing the risk of granuloma if the thread is placed too superficially. Barbed and cogged threads can only be removed with difficulty, if at all. If the end of a thread is left in a superficial plane then there is increased likelihood of granuloma formation. Thread breakage: When first learning how to place cogs and barbs, breakage can be an issue. Typically this occurs during tightening of the PDO cogs and barbs as during placement the thread is protected by the needle or cannula. In the case of Silhouette Soft threads, the thread is not protected in this way and so the tissues must be carefully manipulated in order to avoid breakage during insertion and tightening. 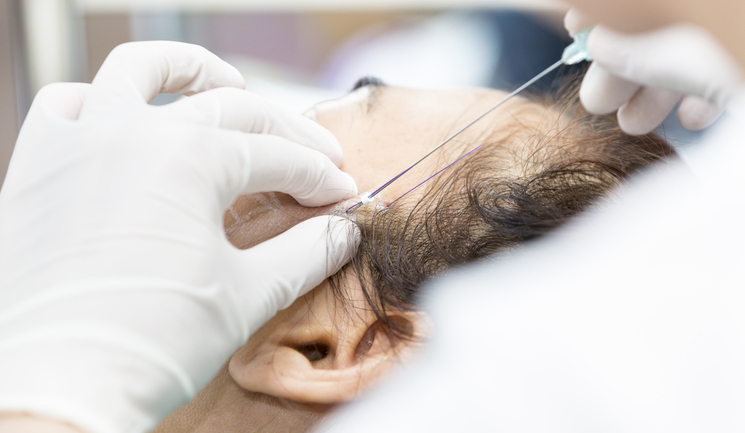 The use of threads provides the aesthetic practitioner with another potential treatment modality and can give more flexibility to reach patient expectations. It is important to select the correct patient before performing a thread lift and to be realistic about the potential treatment outcomes and potential complications of this versatile procedure. De Maio, M. & Rzany, B. Botulinum Toxin in Aesthetic Medicine. (2007). Sulamanidze, M. A., Fournier, P. F., Paikidze, T. G. & Sulamanidze, G. M. Removal of facial soft tissue ptosis with special threads. Dermatol. Surg. 28, pp.367–71 (2002). Abraham, R. F., DeFatta, R. J. & Williams, E. F. Thread-lift for facial rejuvenation: assessment of longterm results. Arch. Facial Plast. Surg. 11, pp.178–83 (2009). Aston, S., Steinbrech, D. & Walden, J. Aesthetic Plastic Surgery. (2009). Sulamanidze, M., Sulamanidze, G., Vozdvizhensky, I. & Sulamanidze, C. Avoiding complications with Aptos sutures. Aesthet. Surg. J. 31, pp.863–73 (2011). Guerrerosantos, J. Evolution of technique: face and neck lifting and fat injections. Clin. Plast. Surg. 35, pp.663–76, viii (2008). Bartus, C. L., Sattler, G. & Hanke, C. W. The tower technique: a novel technique for the injection of hyaluronic acid fillers. J. Drugs Dermatol. 10, 1277–80 (2011). Kalra, R. Use of barbed threads in facial rejuvenation. Indian J. Plast. Surg. 41, S93–S100 (2008). Aitken, R. J., Anderson, E. D., Goldstraw, S. & Chetty, U. Subcuticular skin closure following minor breast biopsy: Prolene is superior to polydioxanone (PDS). J. R. Coll. Surg. Edinb. 34, 128–9 (1989). Della Torre, F., Della Torre, E. & Di Berardino, F. Side effects from polydioxanone. Eur. Ann. Allergy Clin. Immunol. 37, 47–8 (2005).